of land in the City of Gothenburg despite it lost its business purpose already in the 1813. Silk, spices, tea, porcelain and other exotic products of China had been eagerly sought by Europeans since Roman times. But the land route through the deserts along the "Silk Route" allowed only a trickle of Oriental products to reach the Western World. In the 16th century the sea route from the West around the Cape of Good Hope to India and China was discovered. In the centuries that followed the seafaring nations of Europe fiercely competed for control of the China Trade. Sweden had during the 17th century sought to launch a trading company like the VOC in Holland. About this time, in the early 18th century, the Swedish economy was in ruins after almost a hundred years of war with neighboring countries. Sweden needed a new beginning. Peaceful contacts with Europe and the rest of the world were intensified. 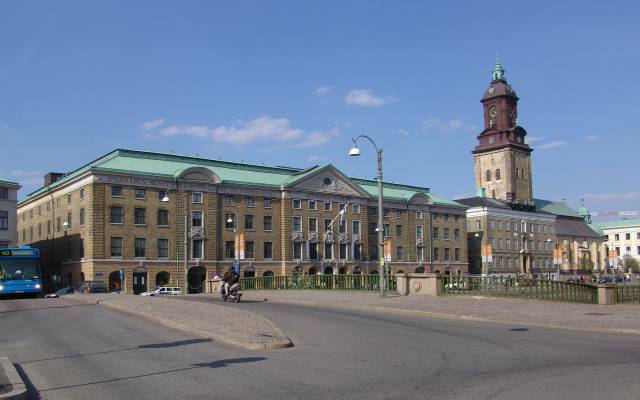 The city of Gothenburg on the west coast of Sweden was ideally located for an important role. The successful English and Dutch East India companies already trading were closely studied and the decision was made to develop international trade with China. The first royal 'privilege' was issued in 1731 and marks the start of the first real Swedish trade relation directly with China. During the years between 1731-1813 The Swedish East India Company (Svenska Ostindiska Compagniet) made over 130 trips between Gothenburg and China of which some also hit India. The journey departed from the port in Gothenburg, usually with a stop in Cadiz on Spain’s west coast, they rounded the Cape of Good Hope and continued towards the South China Sea to reach the Pearl River and finally the goal - Canton. A journey normally took 18-22 months. The trade made by sea was a risky business but was in the beginning very lucrative for the participants. The Swedish East India Company's successful trips to China created a passion and a taste for Chinese art and philosophy during the 18th century. In the early 18th century, the collecting of Japanese and Chinese porcelain became an obsession among the European aristocracy. Separate rooms and castles were built to display the collections. 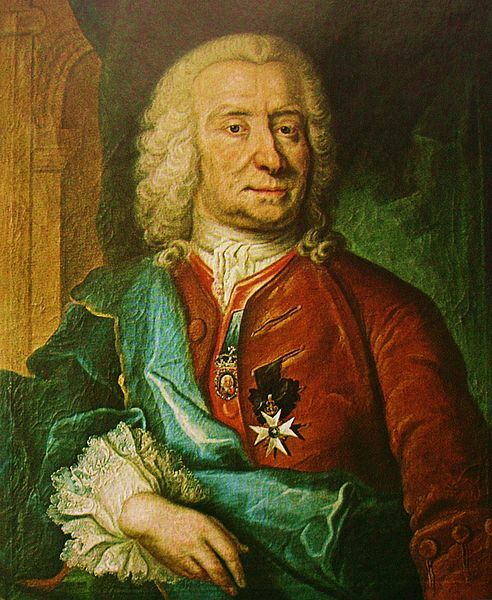 One of the most devoted was Alexander the Strong of Saxony who in the process actually were instrumental in discovering the secret of porcelain making himself. City of Gothenburg in the early 17th century. Detail, as seen from the well known viewing spot at Danska Vägen. Behind the church and houses we can see ships at the Göta River. Top left is New Elfsborg Fortress inserted but it is not actually visible from this spot; it is further out. In 1731 Henric Koenig & Co was given their first Swedish Royal Charter to peacefully trade with "all countries east of India". The most successful business was made with China, through the port city of Guangzhou (Canton). The China Trade was however a risky business. Taxes, tributes and bribes, often hard to distinguish were rife. Storms, pirates, diseases and rival traders were constant threats during the two-year round trip voyage from Europe. Curiosity about the world was great. Some of Carl Linnaeus' disciples went on the trips to conduct studies on flora and fauna, Chinese science, art and culture. They observed and gathered information that could be of use in Sweden for research and development of trade and other things. The seafarers first encounter after passing the Portuguese colony Macau was the Pearl River. About where the Pearl River started to become narrow they encountered a passage that was called Boca Tigris - The Tiger's mouth. Further up the river was the island of Whampoa near which the Western ships laid anchor during the trading season. The last journey up to Canton itself was made in smaller vessels. The Pearl River views were in itself popular motives on paintings and porcelain and numerous views were made by anonymous artists in studios in Canton and exported to Europe. Due to centuries of bad experiences the Chinese rightfully regarded all foreigners with suspicion whatever the pretext. Contacts with the "Foreign Devils" were severely restricted. Trading was allowed only in Canton under the supervision of especially appointed Chinese "Hong" merchants. Foreign merchants were initially not permitted to stay permanently in China and could only visit their warehouses during the trading season. Once trading was finished, the cargo was brought on board - porcelain in bundles, tubs and wooden boxes cushioned with rice paddy or marketable goods such as galangal, pepper, rice, sago, or tea, at the bottom for ballast, followed by chests of tea and finally the precious silks and spices. To trade with the Chinese was difficult both due to the geographical distance as well as the cultural differences. To keep things simple the Swedes brought pure silver cash coins in the shape of minted Spanish coins. A complicating factor was that Swedish East India Company by Swedish law was forbidden to export Swedish silver coins out of Sweden. Not taking home the export profits in the first place, but making them available against documents in Spain, circumvented this. Often as much as 5 tons of minted silver coins were brought onboard in Cadiz. When the ships arrived to China tea, porcelain, silk and spices was bought for the silver. Usually starting from China in the winter with the western trade winds, the cargo was brought back to Sweden to be sold at auction in Gothenburg. The business gave large profits to both the Swedish and the Chinese merchants and continued during more than 80 years. During this period the Swedish company built 38 East Indiamen sailing ships and made 132 trips between Sweden and Asia - most of them to Guangzhou (Canton) in China, but some also touching in India. Most went well but sometimes disaster struck as with the East Indiaman Gotheborg in 1745. During the active period all in all eight ships were lost. 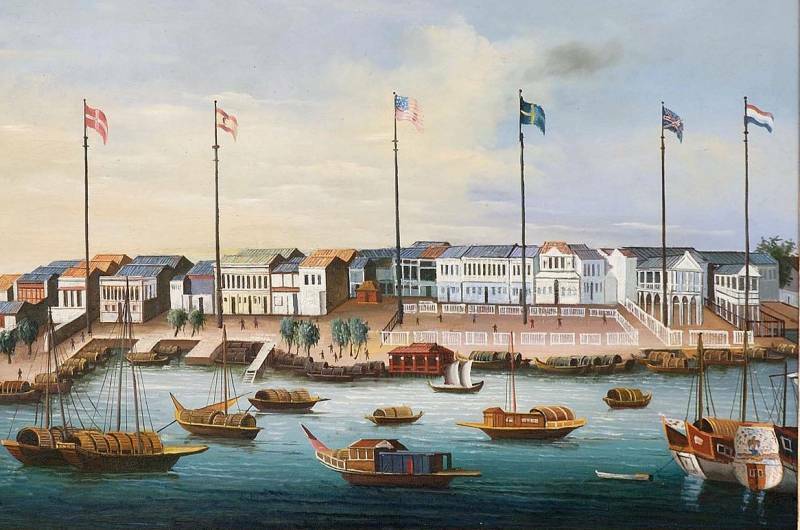 Trade painting of the European trade offices, called hongs, in Canton from which the business was run and where the bought in items eventually was stored awaiting transportation to the ships waiting at the Whampoa anchorage a few miles downstream from Canton in the Pearl River. In its time the SOIC was a very profitable undertaking. The trade created fortunes, industries and promoted cultural exchange, philosophy and scientific research, making Sweden the world leader in several areas. Despite the risks, traders made huge profits for their companies, themselves and their countries. The Chalmers School of Technology and the Sahlgren University Hospital are named after the company directors William Chalmers and Niklas Sahlgren, who donated the founding capital to these today important institutions. Every winter one or several ships was outfitted and sent out to China or occasionally to India, to try their luck in having a safe passage, obtaining a profitable cargo and bringing this, the ship and its crew safely back to its eagerly awaiting shareholders, investors and loving families. In general they would leave Gothenburg in January to February and touch the Straits of Java around July to August. From Java to China would take another month. To settle all businesses in Canton and take in the return cargo would take from mid-September to the end of December after which you would leave China immediately after Christmas to be back home after another 7-8 month. Usually a journey from Sweden to China and back would take from early spring one years to late summer the next, or 17-20 months. If the unfortunate ship was forced to stay at some halfway island to wait for the trade winds of the monsoon periods to change the voyage might take almost one more year, or some 26-31 months. The voyages were dangerous and by far not all of the crew members came back. In 1813, the Swedish East India Trade was given up. Tea was no longer profitably enough because of political changes in Europe. Other companies depended on opium trade for their profits, a trade the Swedish company decided to stay out of.